3 workouts this week in Dongguan. 30/7: for the first time ever I run in the 清溪森林公园 (forest park). I have been here already several times by bike but never running. I headed for a smaller road hoping to make some hill intervals. It looked like the one here... (next time I will bring a camera).. NOTE: slacking a lot on core strengthening and stretching... I really need motivation. the good thing about the school holiday is that I do not need to fetch my daughter to the school bus stop at 7.20am... so more slack for getting up a bit later. - Shatin track: 6x1000m, with 2' recovery jog (back from finish line to 1000m start). Time around 3'32" average. Felt hard but manageable. - Lost 2.3kg of sweat ....during the workout. Archived the first half of 2010, I am trying to focus on running only for a while. Constraints: currently my right Achilles tendon is still slightly painful after some heavier workout. I can feel that is still a bit thickened. I try to monitor the situation and keep going with my stretching, strengthening, etc. Training Plan: since it is bloody hot and since I have the muscles a bit tight from all the cycling, I do not want to rump up the distance too much, but mainly focus on AT workout and mainly on "faster" workouts targeting the neuromuscular capability (strides, hill sprints, etc). On week 28, we spent a nice beach holiday in Samui, Thailand and every morning I went for a good 7-8km run which was mainly a way to get back into the groove of training daily. dopo una stagione sportiva dedicata forzatamente al ciclismo, e' arrivato il momento di decidere il programma per i prossimi mesi. Per farla breve, penso che il ciclismo sia uno sport meraviglioso e che regala piaceri ad ogni uscita, ma e' anche incredibilmente impegativo come tempo necessario per allenamenti e attivita' accessorie, quindi incompatibile con il mio lavoro e il tempo da dedicare alla famiglia. Il mio livello "agonistico" richiederebbe o di accontentarsi delle garette "attorno al campanile" che sono disponibili a Hong Kong, oppure di allenarsi ancora di piu' e lanciarsi in vere gare anche in Cina ed in giro per l'Asia. Il mio team sta lanciando un programma di questo tipo (partecipazione a gare Elite in giro per l'Asia orientale), ma devo lasciare da parte la passione e ragionare serenamente e razionalmente. In pratica, basta ciclismo (se non qualche sgambata rilassante) e di nuovo al 100% podista. Non voglio fissare un programma impegnativo (Maratona..) perche' il tendine destro ha ancora un punto che e' un po' dolente, quindi devo fare molto per gradi. Se il tendine mi abbandona ancora, ovviamente sara' il caso di mettersi il cuore in pace con la corsa... ma se regge, voglio fare ancora un po' di stagioni cercando di essere competitivo e esplorando i miei limiti. As for this older post, I added orthotics to my shoes. Honestly it took me a while to get the benefit from it, because the addition of orthotics changed completely the set-up of the bike/saddle/cleats/whatever... so putting the insoles in the shoes it is only the first step. - I have a severe degree of bow legs. Actually, the problem is even trickier because the kneed themselves are not too bad, but is the tibias which are terribly curved inward. - after a lot of hesitation, I gave up my fight with the hostility to idea of wearing orthotics and got suitable stuff from a qualified podiatrist. The podiatrist worked out a shape for the insole so that the feet get tilted "outwards" to align the feet to the ankles and to the lower leg. The inversion of the foot is now compensated by the inside thickness of the orthotics..
(see the old post for close-up pics of the carbon fiber insoles). - cleats in the most inside position of the show (means feet moved outwards as much as possible). - knees totally NOT aligned with feet on the pedal: feet were more outside then the knees and the knees were describing a oval during the pedal stroke. 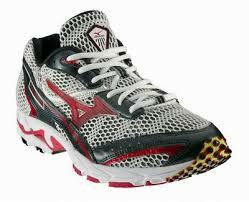 Once I wore orthotics without changing the overall set-up, I felt "strange" and not really feeling major improvement. - complete change on the position of the cleats, which are now fixed in a way where my feet are no more pointing outwards, but straight and also very close to the crankset. - on top of that all, I also added 2 wedges (from www.bikefit.com) to give additional tilt to the feet and therefore even more alignment with the lower leg. These wedges are awesome idea and could really solve a lot of problems for people with leg/knee issues. All together, now the push from the legs goes to the pedal in a straight way and the whole system tight/tibia/ankle/foot works without too many dispersion of force (before, most of the muscle effort was spent in keeping the legs/knees/ankles in a straight line.. now it comes naturally because the orthotics and the wedges aligned the system). Working with a "straighter" leg, also gave the opportunity to increase the saddle height to a better working angle for the knee, thus increasing also the power of the stroke. a) the right leg is spot on 100%..
c) I will switch pedals to Speedplay (which are simply better...), also because my Look Keo are already showing signs of fatigue (bearing got loose because of the transversal component in my pedal stroke...). 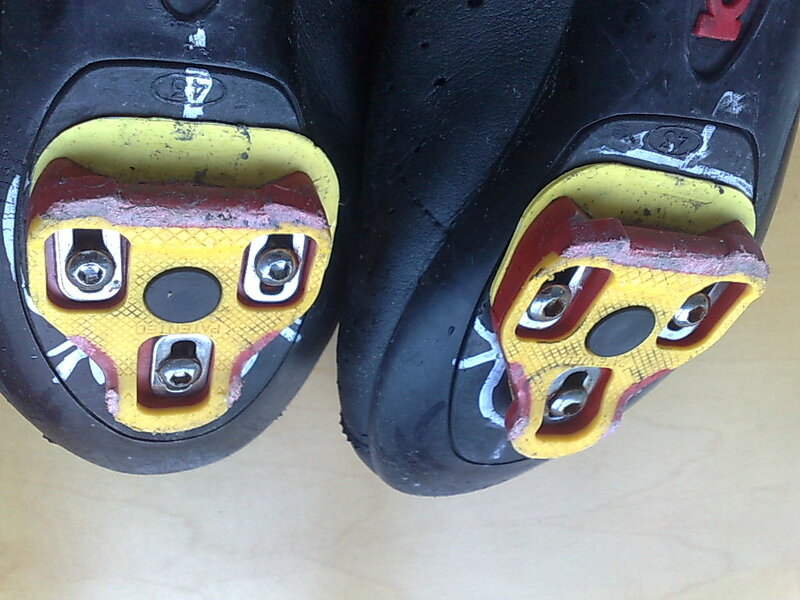 Speedplay allow more cleat adjustment and the whole show/pedal interface is better. Probably the best way to tune-up the set-up is to place the bike on the trainer in front of a mirror, stick reflective sticker on the knees, film the pedaling and go for different slight adjustement until you can reach a good alignement between knee and pedal or at least avoid many parassite movement of the knee (seen from frontal view). For the HW, you can use any videocamera or digital camera with video function. For the SW, I would recomment to download this program which is open source and do the job in excellent way. I personally did not complete yet this stage, so I will keep posted once I have videos to show and the final results. A massive low pressure front hit HK in the weekend and Saturday the Time Trial was cancelled because of the rain. So Sunday morning I woke up at 4am and it was glad to see that it was not raining; roads were wet, but it seems a decent morning for the race. The course was in remote area of HK, with twisting downhills under the trees... in short, slippery when wet. At the planned start time of 6am (yes... a bit early, but cycling races in HK are all dependant on the road closure permit from the Police... which is very hard to obtain... ), we were told to wait a bit more and that was just enough for a massive tropical thunderstorm to begin: rain start pouring down right in droves. The descents are covered of rain and the road starts to be flooded in several points... I am really scared to go down at some turn. - after 4 laps (60km), I am really tired... I never trained more than 50/60km and I start to feel the distance. In our small group we agree to keep going together to the finish line. We are out from the fight for the win, but still in honorable position. The leading group is in front of us of maybe 1-2 minutes. COMMENT: now with relaxed mind, I can say that I did a great race, for sure at 100% of my capability. Looking at the results, ahead of me mainly Elite 1 riders (most of them are Pros with the National Team) , plus John T and Darren B (whose names do not need comments for local readers..). All other Master and Elite 2 are behind. So the 4 weeks of real training did really paid a dividend. For the whole race, I averaged 172bpm...which is an effort level higher than a marathon.. peak at 192bpm is which my real max for cycling... so for sure I did not spare the effort. Average speed of 33kmh, which gives an idea of the difficulty of the course and the rain.